The parish was formed in 1933 out of parts of Hove and Aldrington (CDG Sept 1933 p338), as the estates on the Downs spread inland. 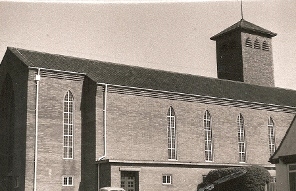 The church was completed in 1938 to the design of Sir E Maufe (ICBS) and cost £12,000 excluding fittings (Maufe p54). The dedication commemorates James Hannington, first Bishop of Eastern Equatorial Africa, who came from Hurstpierpoint and was killed in what is now Uganda in 1885 (DNB). The architecture is characteristic of Maufe’s work in the 1930s, built of brownish brick and combining vestigial gothic with other less expected influences. Thus, the tall nave windows and arcades are pointed, but the small balcony with iron rails on the tower could be Scandinavian, whilst the outline of the tower itself inclines more towards Italy. Like the architect’s best known work, the almost contemporary Guildford cathedral, everything is deliberately unostentatious and low key. Inside, the west gallery and low flat-roofed aisles barely impinge on the central space of the nave, which is plain white; the only colour comes from the pale blue roof. Maufe incorporated the main fittings in the fabric, with the pulpit and reading desk either side of the chancel arch and a small octagonal font in the south chapel. At a re-ordering in 1981 Maufe’s pews and stalls were removed (BE(E) p291). Reredos: 1941, painted by A Lunn (Jasper p129).